The U.S. has worked to break Haiti for over 200 years. We owe Haiti. Not charity. We owe Haiti as a matter of justice. Reparations. And not the $100 million promised by President Obama either – that is Powerball money. The U.S. owes Haiti Billions – with a big B. The U.S. has worked for centuries to break Haiti. The U.S. has used Haiti like a plantation. The U.S. helped bleed the country economically since it freed itself, repeatedly invaded the country militarily, supported dictators who abused the people, used the country as a dumping ground for our own economic advantage, ruined their roads and agriculture and toppled popularly elected officials. The U.S. has even used Haiti like the old plantation owner and slipped over there repeatedly for sexual recreation. Here is the briefest history of some of the major U.S. efforts to break Haiti. In 1804, when Haiti achieved its freedom from France in the world’s first successful slave revolution, the United States refused to recognize the country. The U.S. continued to refuse recognition to Haiti for 60 more years. Why? Because the U.S. continued to enslave millions of its own citizens and feared recognizing Haiti would encourage slave revolution in the U.S.
Haiti was forced to borrow money from banks in France and the U.S. to pay reparations to France. A major loan from the U.S. to pay off the French was finally paid off in 1947. The current value of the money Haiti was forced to pay to French and U.S. banks? Over $20 Billion – with a big B. 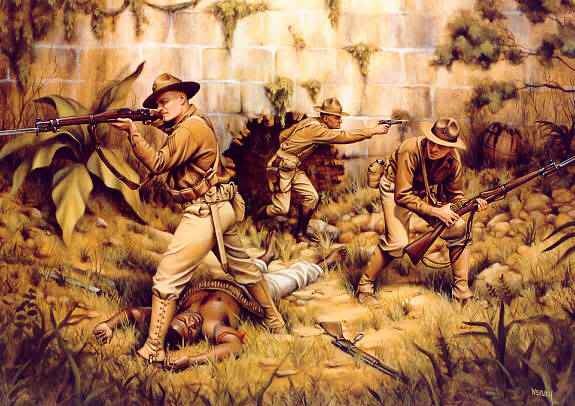 The U.S. occupied and ruled Haiti by force from 1915 to 1934. President Woodrow Wilson sent troops to invade in 1915. 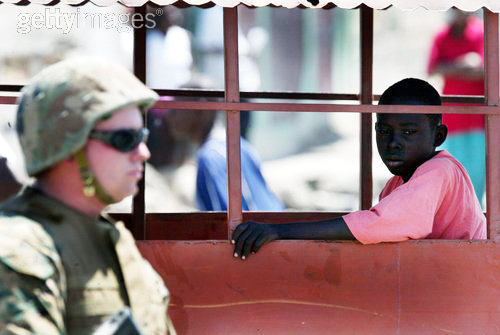 Revolts by Haitians were put down by U.S. military – killing over 2,000 in one skirmish alone. For the next 19 years, the U.S. controlled customs in Haiti, collected taxes and ran many governmental institutions. How many billions were siphoned off by the U.S. during these 19 years? From 1957 to 1986 Haiti was forced to live under U.S.-backed dictators “Papa Doc” and “Baby Doc” Duvalier. The U.S. supported these dictators economically and militarily because they did what the U.S. wanted and were politically “anti-communist” – now translatable as against human rights for their people. Duvalier stole millions from Haiti and ran up hundreds of millions in debt that Haiti still owes. Ten thousand Haitians lost their lives. Estimates say that Haiti owes $1.3 billion in external debt and that 40 percent of that debt was run up by the U.S.-backed Duvaliers. Thirty years ago Haiti imported no rice. Today Haiti imports nearly all its rice. Though Haiti was the sugar growing capital of the Caribbean, it now imports sugar as well. Why? The U.S. and the U.S. dominated world financial institutions – the International Monetary Fund and the World Bank – forced Haiti to open its markets to the world. Then the U.S. dumped millions of tons of U.S.-subsidized rice and sugar into Haiti – undercutting their farmers and ruining Haitian agriculture. By ruining Haitian agriculture, the U.S. has forced Haiti into becoming the third largest world market for U.S. rice. Good for U.S. farmers, bad for Haiti. In 2002, the U.S. stopped hundreds of millions of dollars in loans to Haiti which were to be used for, among other public projects like education, roads. These are the same roads which relief teams are having so much trouble navigating now! 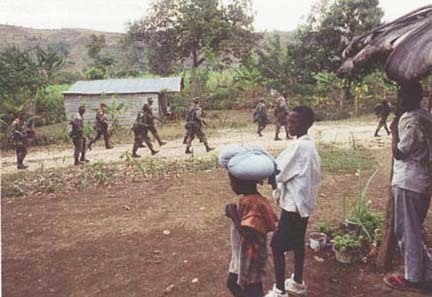 In 2004, the U.S. again destroyed democracy in Haiti when they supported the coup against Haiti’s elected President Aristide. Haiti is even used for sexual recreation just like the old time plantations. Check the news carefully and you will find numerous stories of abuse of minors by missionaries, soldiers and charity workers. Plus there are the frequent sexual vacations taken to Haiti by people from the U.S. and elsewhere. What is owed for that? What value would you put on it if it were your sisters and brothers? U.S.-based corporations have for years been teaming up with Haitian elite to run sweatshops teeming with tens of thousands of Haitians who earn less than $2 a day. 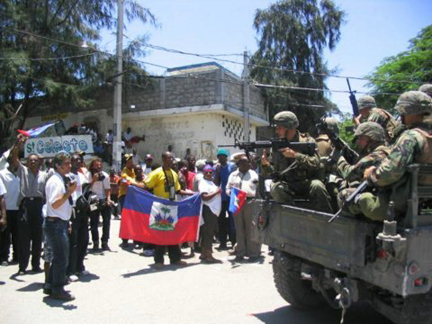 The Haitian people have resisted the economic and military power of the U.S. and others ever since their independence. Like all of us, Haitians made their own mistakes as well. But U.S. power has forced Haitians to pay great prices – deaths, debt and abuse. It is time for the people of the U.S. to join with Haitians and reverse the course of U.S.-Haitian relations. This brief history shows why the U.S. owes Haiti Billions – with a big B. This is not charity. This is justice. This is reparations. The current crisis is an opportunity for people in the U.S. to own up to our country’s history of dominating Haiti and to make a truly just response. Bill Quigley is legal director for the Center for Constitutional Rights and a long-time Haiti human rights advocate. He can be reached at Quigley77@gmail.com. Another white-hating, left-wing Nazi kook vomits his hatred. Scratch out the word "America" (by which he means white America) and put in the word "Jews" and you'll understand the full flavor of this nutty conspiracy rant. No, America didn't break Haiti, it's broken because of the blacks who run it. Newark would be just as bad if it didn't have whites propping it up. As a liberal racist Quigley is incapable of criticizing blacks because that would ultimately call into question the value of multi-culturalism, and that is a threat to his political power back home. wow. a perfect example of an amerikkkan suffering from a terminal case of white supremacy disease. why don't you neo nazis return to the european prisons your ancestors escaped from and leave turtle island in peace. btw, bill quigley isn't a politicain, you idiot; he's a social justice legal hero. Tragically the US destruction of local agriculture has not been confined to Haiti. Our own farmers have been driven off their land by government subsidies that go only to mega operations which destroy the land and the water. Real farmers who rotate the crops and otherwise care for the land get nothing. Likewise these subsidized crops, soy, corn, rice and cotton then are used to drive farmers off their land around the world, especially Mexico, where this agricultural policy has been responsible for the “greatest immigration in history”. “Another white-hating, left-wing Nazi kook vomits his hatred. Scratch out the word “America” (by which he means white America) … No, America didn’t break Haiti, it’s broken because of the blacks who run it. Hey John C., from the looks of your own un-insightful “vomitted hatred” comment it looks like you forgot to read the entire article. Shut up and get educated! What do you recommend as far as initiating a dialogue? What do you recommend as far as Haitian and U.S. citizens working together to reverse the course of U.S.-Haitian relations? they don't have to really even help. All the U.S. has to do is I guess to just stop the shipment of U.S. rice to Haiti. As long as they keep on selling super their cheap U.S. rice to Haiti they're going to continue to put all the countries' farmers out of business because they can't compete with the U.S. low prices, so that's why now Haiti have become U.S. #1 rice consumers because nearly all rice sold in Haiti comes from the U.S. and having more import than export is usually bad for the economic of a country. That's why the U.S. usually put taxes on it's it's imports to avoid U.S. workers losing their jobs due to being outsourced by workers overseas. blah blah,blah haiti will never get right not until the haitians run their country. for now the land of NGO’s. question: why can’t the NGO’s get right? Haitian blacks are lazy, stupid, full of cruelty and malice, or like blacks in America and elsewhere, would have to leave many of these communists, liberals, and scoundrels'' chosen'' among this black forest, without soldiers or armed guards to see, the last living and complete before the wrecking black poor, all these liars who preach one thing and do another EVIL aND DESTRUCTION oF WESTERN CIVILIZATION, liberal-communist and their heads, are the scum of the earth. oh my who let you out of your cage- lol!